I finished up the quilting on this last night. 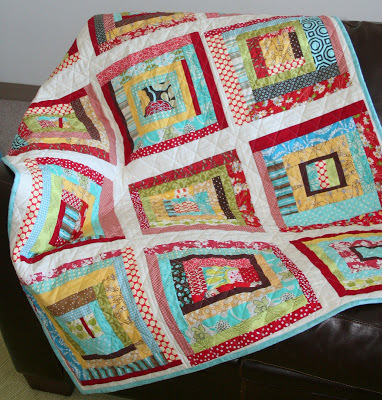 I wanted the quilting to look like this, and I really like the diamond pattern with the log cabin blocks. Straight quilting takes me longer than stippling, just because I have to start and stop more often, but I really like the look of it. And it makes the quilt softer and more pliable. More quilting= stiffer quilt. The back is flannel, because its 6 degrees outside and the flannel back quilts get the most use in my house. LOVE this one!!! 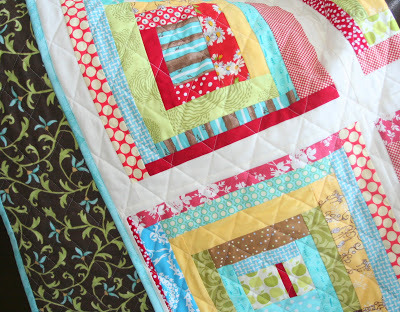 Love the colors, the quilting and just “looking” at it!! Great job and one can never have too many quilts…I should know. Another spectacular quilt. I’m not sure that you can ever have too many quilts. At least that’s my story. and man oh man, do I love that basket of quilts. beautiful stuff in there. If it were me, I would want to look at it 24/7! Great job, Al! I too could look at it for quite some time! This came out wonderfully! My husband asks me the same thing after I make a quilt, lol. I like to fold mine up and just stare at it for a long time thinking of what I accomplished! Yours all look gorgeous in your quilt basket. I came to this quilt via flickr . .and i have to say it made my heart happy. I LOVE IT!! Will be diving around your site and happily clicking away! My husband always asks that same question. I like your answer! These look so pretty in that great basket. Remember, quilting is an ART. No one asks a painter why she is painting yet another picture! Tell him you are making them for all of us out here in Blogland-we need the inspiration! I love the teal and red- I must make myself one! Okay so I’m finally ordering a Bernina-can you tell me what model yours is? And would you recommend a walking foot? What foot do you use for stippling? Thanks! You should never stop making quilts… You're so talented. Like another reader said-it's an art, and you are obviously an artist when it comes to quilt making/designing! You could begin to sell them though!